I don't know about you, but I love to go out to eat. I get sick of cooking and cleaning up after my kids three times a day. I like to sit down in a place that doesn't have food stuck to the floor (at least at the beginning of the meal) and get served food that I would never make at home. Eating out, in combination with a 12 month old that doesn't sit still, likes to scream at the top her lungs, and has grabby hands does not a happy experience make. A few weeks ago I took my girls out to lunch at the Yard House, one of our favorite kid-friendly restaurants. Why is it kid friendly? It is loud, there are televisions (which are always playing sports, but they are a distraction to any kid) and it isn't fancy. I spent the entire time I was there using my left hand to feed M food while she watched the iPad, and the other hand either holding a bottle in Val's mouth or picking up whatever she threw on the floor. As soon as my food arrived I asked the waitress to put it in a to-go container. I ate my soggy salad 2 hours later after we got home and put Val down for a nap. Today I met a good friend of mine, and her two kids (ages 3 and 6) for lunch. I warned my friend that lunch with Val is "chaos," but I don't think she was mentally prepared for lunch with the Tasmanian Devil. Val spent the entire time throwing things on the floor, trying to escape from her high chair and grabbing at anything and everything, until she finally (God only knows how) pulled an iced tea on herself. I ended up wrangling and entertaining Val while my friend ate, and then she so generously took over so I could woof down my salad. It was a typical restaurant experience for me, but today I felt like instead of people around us being understanding I was getting looks left and right. Next to us was a table of grandmother aged women who I thought would feel sorry for us and the chaos, but instead were throwing shade our way the entire meal. Even when I apologized to them for Val's behavior on more than one occasion I didn't get anything but stink eyes in response. 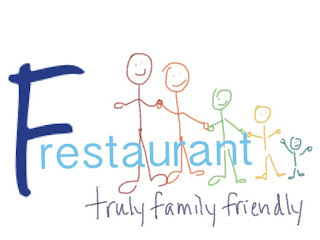 Frestaurant will only serve parties with kids ages 0 - 6. All meals will be served on melamine plates (nice looking ones of course), and all glasses will be acrylic, so you don't need to worry about your children breaking dishes or glasses. The food will be delicious - not fried bar-food crap that you usually get at family restaurants. The menu will offer "kids size" portions of all the adult menu options, so that your kids can learn to eat food other than grilled cheese, chicken fingers and pizza (these will also be offered on a separate kids menu, and will be made of all natural ingredients). There will be a call button at each table so that you can get your waiters attention without having crane your neck around looking for her/him. Your check will automatically appear when you push a button at your table, and you are able to swipe your credit card yourself (like at those self-check outs at the grocery store) so that you aren't waiting forever for your check to come. 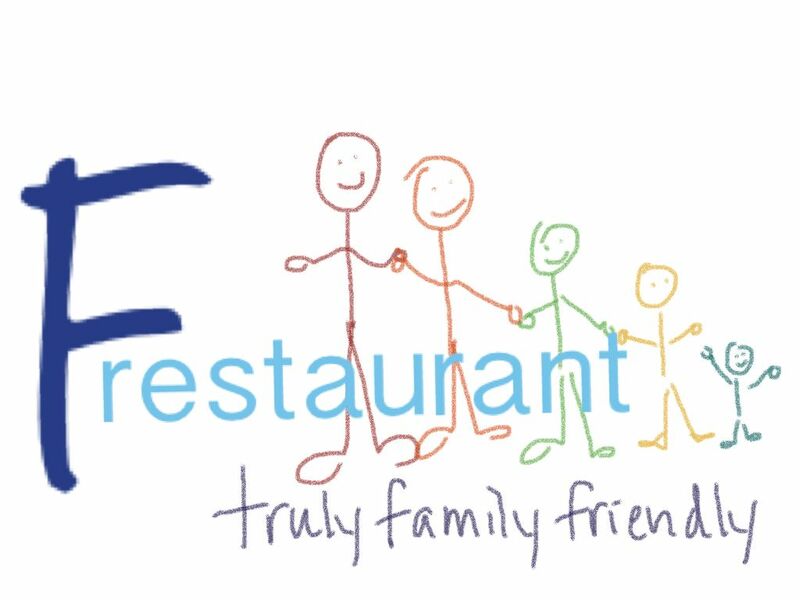 Frestaurants will have "baby wranglers." Does your child not like to sit still? Our baby wranglers will walk your child around in your stroller, being within eye sight at all times. Does your baby like to be rocked? Our grandma baby wranglers have years of experience with babies and will happily take your baby to one of our rockers near your table and calm your baby down while you enjoy your meal. Frestaurants will also have "toy wranglers." Does your baby like to constantly throw things on the ground? Well our toy wranglers have lightning fast reflexes and will be in charge of picking up what your baby drops, quickly cleaning it off and giving it back to baby. There will also be a play area that your kids can enjoy once they are done eating (ok, maybe they shouldn't be running around after eating, but we can figure out that later) or while they are waiting for their meals to come. We will have trained babysitters watching them at all times in the play area as well. At each table there will be iPads for your kids to enjoy. They will be fully loaded with educational applications, not television shows or movies. Don't worry about them dropping them because they are built into the table! And parents, don't you worry! If you have enjoyed our extensive wine list a little too much, we also have someone that can drive your car home! Sounds like a happy place, no??? Investors can leave comments and questions below. Trained babysitter is every parent's need. If the babysitter is trained they can handle your child with proper care and in a safe manner. If your babysitter is not trained you can face many problems in the future. At the time of hiring a babysitter ask all questions related to his experience after that take any decision. In many countries like Findahelper-babysitting jobs UK, you can find a babysitter for your child. Yep, that is a good idea to make kid sized portions. And certain menu changes would be welcome. شركة غسيل مكيفات بالرياض شركة اصلاح مكيفات بالرياض شركة فك و تركيب مكيفات بالرياض شركة صيانه مكيفات بالرياض شركة تنظيف مكيفات بالرياض الصراصير : بجميع انواعها ( الصراصير المنزلية,صراصير المجارى … الخ) و مهما كان حجمها او عددها بعد فحص المنشأة جيدا للتعرف على اماكن اختبائها و يقوم الفريق بسد جميع الجحور مع التركيذ فى رش المبيد على المطابخ الخشبية و اسفل الاحواض و خلف الاجهزة الكهربية و الخزانات ( ينصح بوضع مفارش بلاستيكية فى ارضية ادراجالمطابخ الخشبية كعامل وقائى ). النمل : بعد الفحص ايضا للتعرف على اماكن جحوره يتم استخدام المبيدات الملائمة و نشرها فى تلك الجحور و بعد ذلك يتم سدها تماما بالاسمنت او الجبس ثم ترش المنشأة بالكامل مع التركيذ على اضيق الاماكن و اصغرها لضمان التخلص تماما من تلك الحشرة ( ينصح بالتخلص من اى فتات اطعمة على الارضيات ). شركة مكافحة الحشرات فى الجبيل العث : قوم بشر جميع خزانات الملابس و غرف تخزين الاغراض القديمة و جميع المنسوجات و المفارش للتخلص من تلك الحشرة كما يتم اتخدام بعض المواد الطبيعية كاوراق الريحان كعامل وقائى طبيعى ( توضع اوراق الريحان الجافة فى اكياس بلاستيكة ثم توضع بالخزانات و الادراج ) و ينصح الفريق بتعريض جميع انواع المفروشات الى ضوء الشمس كلما امكن بحد ادنى مرة شهريا و صنع فتحات تهوية بالخزانات مع سدها بطبقة رقيقة من القماش. تعد شركة كشف تسربات المياه بالمدينة المنورة من أكبر شركات كشف تسربات المياه بالمدينة المنورة و الصيانة و الترميم وهي رائدة لما تقدمه من خدمات مميزة و هذه الخدمات تشمل كشف تسربات المياه و عمليات عزل مائي و عزل حراري كما نقدم خدمات نقل أثاث و تخزين العفش و تسليك مجاري و تنظيف البيارات و تنظيف فلل و قصور و خدمات التنظيف بجميع أنواعها حيث تمتلك الشركة جميع المُعدات و الأدوات الحديثة التى تُسهل علينا أعمال الصيانة و النظافة و توفر الوقت و المجهود ونقدم لك أخي العميل خدمة عملاء متميزة لتسهيل عملية التواصل مع العملاء وسماع الشكاوى والمقترحات والرد على جميع الاستفسارات.